A Technical Preview of Power BI in SQL Server Reporting Services is now available in the Azure Datacentre. Following, a release will be available to download and use. 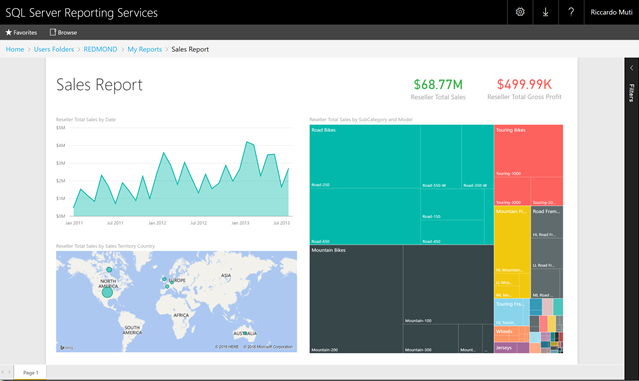 The Update allows Power BI Reports to be viewed inside Reporting Services Native Mode Report Manager. If you can’t wait a week, to access the Preview install the Azure Virtual Machine “SQL Server Reporting Services Preview”. Search for “Power BI” and locate the Preview Virtual Machine. After some quick setup, your Power BI Native Mode On Premise Demo Portal will be installed and available.